February 20th is the “official” shipping date of Swiss Chocolate. Of couse, it is Sunday, so that would mean Monday is the official shipping date. Then again, tomorrow is President’s Day, so maybe Tuesday is the date. At any rate, it should be showing up in stores soon. To celebrate, I do have a new quilt from this collection to share with you. “A Box of Chocolates” is in the April/May 2011 issue of McCall’s Quick Quilts, which is starting to ship to subscribers now and will be in newsstands in early March. At 76-1/2″ x 94-1/2″, it is a great size for a bed, and quite simple to make. I really had fun laying this one out. Kimberly at Fat Quarter Shop was kind enough to put together some kits for this quilt, along with some cuts of backing fabric, which is the caramel-colored tone on tone print you see on the front of the quilt. They’ll be shipping in a couple of weeks, but you can sign up to be notified when everything is ready at her site. 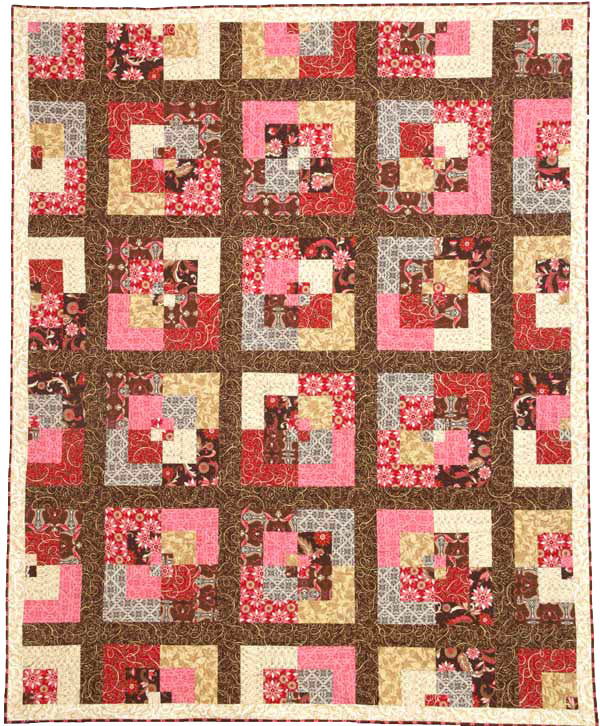 You’ll still need to purchase the April/May version of Quick Quilts, and you can use the same backing fabric that Kimberly offers for the red and brown kit. Also, I was ever able to get in contact with Carol to claim her Ambrosia giveaway prize, so I’ve used the Random Number Generator to pick a new winner. I am doing Blockapalooza, and decided to come to your blog after seeing what you have done there. I’m embarrassed to say I wasn’t aware of your work before that, but I am, after all, a “noob!” Anyway, I just wanted you to know I’m not just following you because you are giving away free fabric! Thanks Mary – and don’t feel badly – my first collection of quilting fabrics came out this past year! Isn’t the blog-a-palooza program fun? Previous post: ANOTHER Swiss Chocolate Giveaway!!! Wow, this is another great quilt. I love everything you have made with Swiss Chocolate.